✿ Whether you are a highly skilled photographer, or favorite novice to photography. ✿ Camera Stabilizer will be the best companion for your photography, Be your own director and discover the beauty of life. ▪ Camera companion, SLR triaxial stabilizer. ▪ Brushless magnetic steel integrated motor. ▪ Aluminium alloy, durable stripe feel, non-slip design. ▪ No need to switch, can be directly transverse or inverted. 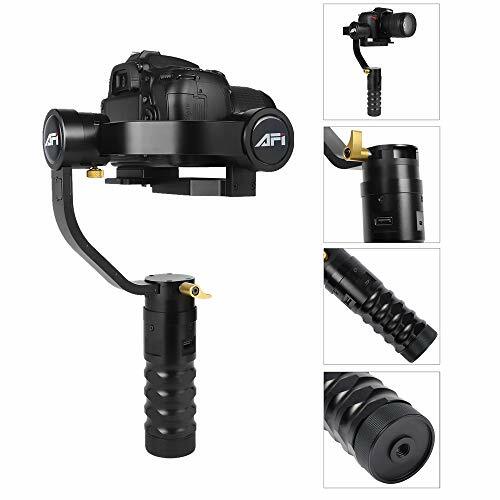 ▪ Roll axis, pitch axis, heading axis, three-axis stabilization system. ▪ Simple quick release plate, easy to install. Very easy to manipulate. ▪ Let you take a steady and smooth picture, suitable for a variety of occasions, long battery life. ▪ Even outside shooting out of power you can also use the mobile device such as charging treasure to charge the PTZ. ▶ What’s in the package? You can contact us if you encounter problems.We will patiently answer for you. ✿ Compact and Convenient – Made of aluminum alloy, the body weighs only 1.1kg and the load capacity is up to 1.7kg. Long battery life, convenient USB charging. ✿ Stabilization Technology – Semi-follow, full follow, lock three modes. Capture great shots, sharing touching stories. Its pan/tilt combines a humanized handle and three-axis stabilization technology. Help you take pictures of a stable abortion. ✿ Simple to Operate – One power button, one function button. Let you throw away the cumbersome manipulations and get started easily. ✿ Easy to Install – Enhance the original camera quick release plate and adjust the balance easily. So you can quickly enter the work state. ✿ Integrated Motor – AFI closed motor technology combines the magnetic field source with the battery. The motor volume is made smaller, but the torque is not reduced.